Too Many Roof Vents ?| Bert Roofing Inc.
Can A Roof Have Too Much Ventilation? The photo above shows a typical roof with three of the most common types of roof vents, Ridge Vent (near), Turbine Vent (far), and thermostatically controlled electric power vent in the middle. At Bert Roofing we use all three types with great success. Each type can properly ventilate an attic. So what is the problem here? In the photo above we see all three of the main types of roof vents. Problems arise when you use different types on the same attic space (notice I did not say same roof, we will explain that one in a moment). The ridge vent and the turbine vent are passive and rely on convection, hot air rising to work. The power vent forces air at the top of the attic out. When a power vent sits next to a passive vent, the power vent may draw air from that passive vent. In the photo above, the power vent will draw air from the ridge vent and the turbine vent. Essentially what is going on here is this poorly thought out system is drawing air from one part of the top of the attic to another. The end result is little to no ventilation of this attic despite the fact it has double the roof vents on it. The roof in the photo had two power vents which by themselves was plenty of ventilation. The additional ridge vent and turbines made the situation worse. A more complex issue is when you have different types of passive ventilation on the same attic such as ridge vent and turbines. While this is no where near the same as the impact with power vents, it is generally best to go with one or the other and not mix these as well. A roof with different attics that are not connected can have a different type of ventilation of each. The photo above shows only exhaust vent which your roofer installs, but that is only half the equation. The best attic ventilation systems are balance with equal amounts of intake and exhaust. The other half of the equation is intake. Intake usually is in the for of soffit vents, little grills under eves of your house. On passive vents you should have approximately the same number of square inches of intake as you do exhaust. For most, the requirement is 300 to 1, meaning one square foot of ventilation is required for every 300 square feet of attic floor. That one square foot is then divided equally between intake and exhaust. Even with all the same type of vent, you need to have them in proportion to your intake vents. 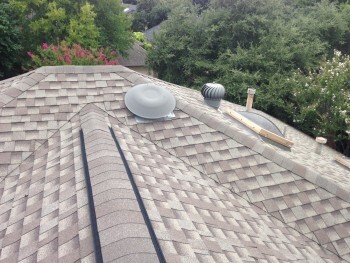 Bert Roofing installs all types of ventilation including ridge vent, power vents, and turbine vents. Please give us a call at 214-321-9341 of fill out our online contact form.